Spain’s Last Conquistador, Don Juan de Oñate, set out from his colony in New Mexico in 1601 to explore the lands north and east of the of the Rio Grande. His group of more than 70 Spanish soldiers and priests, an unknown number of Indian soldiers and servants, and seven hundred horses and mules traveled through parts of today’s Texas and Oklahoma to the border of south central Kansas. They ran across many different large and small groups of natives who were friendly or hostile. The expedition was seeking riches of gold, silver, and precious metals believed to be located in “Cibola”, fabled “Seven Cities of Gold” and the “Great Settlement” described to the Spaniards by other native groups. With the help of a native guide and by using sign language, the Oñate expedition was able to express their peaceful intentions to the natives encountered. The Spanish soldiers had plenty of experience fighting natives in the New World since they were constantly going into new lands and displacing the inhabitants. The Spanish priests came to save the native souls and convert the natives to the Catholic religion. However, the conquistadors and soldiers cared little for the native lives and were fully prepared to battle natives to the death or torture the natives to secure the Spanish objectives of land and riches. The Spaniards were well equipped to fight battles with hostile natives. They were armed with two cannons and cannon shot. At this time, the horse was unknown to the native people so riding horses made the Spaniards look like gods. Personal weapons included steel swords, spears, cross bows and a gun called a ‘Harquebus’, which was a large musket of sorts. This is the weapon that natives feared since it created the sound of thunder. Soldiers and their horses were protected by partial armor, helmets and chain mail. In September 1601, just before arriving at the Great Settlement, the Spaniards met up with a group of native warriors that they called “Escanxaques”. These warriors were the enemies of the people of the Great Settlement. They were hunter-gatherers and wanted to rob the Great Settlement of its food stores. Weapons of the native groups in 1601 were limited to bows, arrows with stone tips, wooden spears with stone blades, stone knives and war clubs made with heads of stone, horn, bone and hardened wood. Most of these weapons required close hand-to-hand fighting to be effective. Arrows shot from wooded bows had little effect on Spanish armor. The Excanxaques initially made friends with Oñate’s expedition. They recognized the fighting power possessed by the Spaniards and they wanted to join with the Spaniards to attack the occupants of the Great Settlement. To incite the Spaniards, the Excanxaques told a story of the Great Settlement natives holding a prior Spanish explorer as a prisoner. Oñate had no interest in joining the Excanxaques to fight and told them to stay back. The Spaniards would later call the natives of the Great Settlement “Rayados”, which is the Spanish word for “striped”, referring to their custom of painting or tattooing their faces (around the eyes) like raccoons and bodies with solid and dotted lines and circles. The Spaniard’s initial meeting with the Rayados would come from across the (Arkansas) river. The Rayados made the universal native sign of war by shouting and throwing dirt into the air. The Spaniards sent back the native sign for peace. Upon receiving the peace sign, the Rayados decided to peacefully meet with Oñate’s expedition. As they came into the presence of the Rayados chief, the Caratax, the Spaniards took him as a guide and hostage along with some females and some boys. The Caratax remained calm and he was treated very well. The other Rayados of the Great Settlement saw the capture and the entire town ran up river, leaving the the town completely vacant. The Excanxaques had been quietly following behind Oñate’s expedition. When the Rayados ran from their settlement, the Excanxaques warriors moved in to the south end of the town to steal the food supplies and burn the huts. Oñate send some of his soldiers to fight back the Excanxaques and stop them from entering and burning the town. Oñate’s expedition spent three days surveying the Great Settlement. The Rayados called their town “Etzanoa”. Once the Spaniards soldiers realized that the settlement held about 20,000 natives with more probably up river, they became frightened that a large group of Rayados would soon attack and overwhelm them. The soldiers convinced Oñate to turn around and head back through the settlement to return to New Mexico. As the expedition moved through the south end of the Great Settlement, they were ambushed by a group of 1500 Excanxaques warriors. 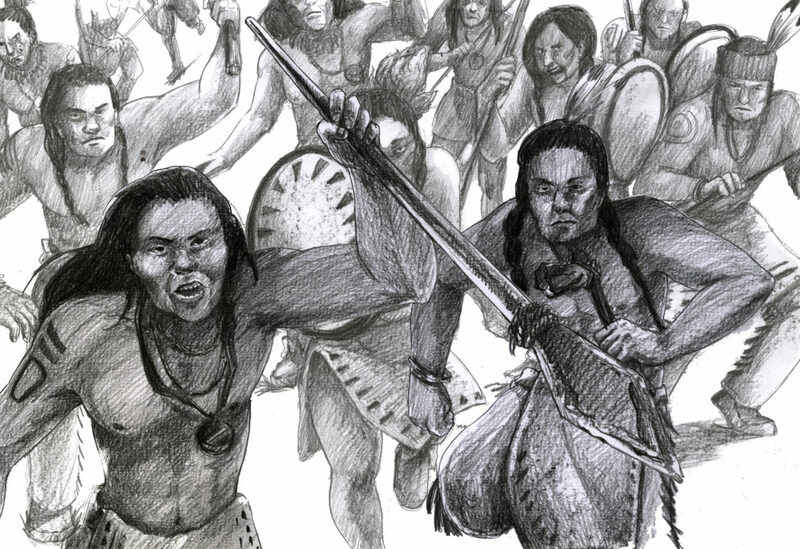 The warriors intended to raid Etzanoa and steal the food sources of the Rayados as well as the supplies, the livestock and horses of the Spaniards. The horses possibly being the greatest prize of all. 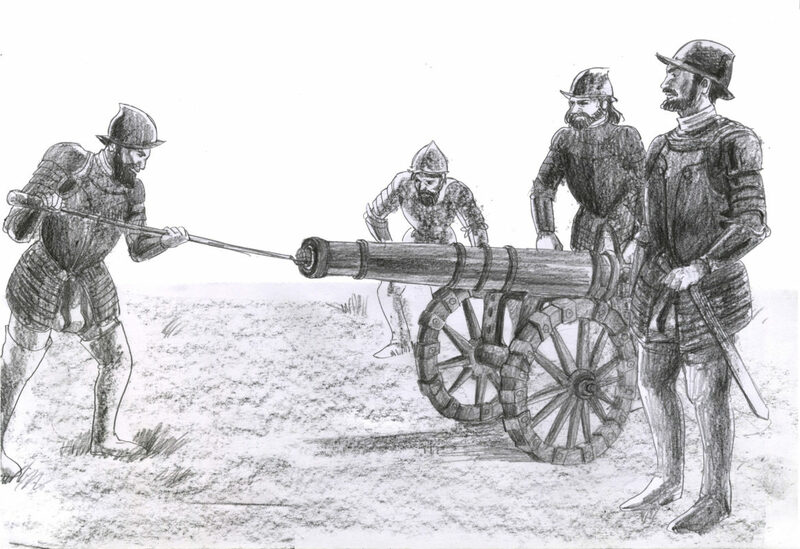 The Spaniards were able to repel the warriors and keep them at a distance with their firearms and cannons, as they moved southward probably in a manouver called a fighting withdrawal. The Excanxaque warriors fought with their primative weapons and ran to take cover from the Spanish bullets in a giant rock-lined ditch at one end of the battlefield. The Excanxaques arrows were not effective on the Spanish armor, but they did cause injuries to at least 50% of the Spaniards on body parts not covered by armor. By keeping the Excanxaques at a distance, the other weapons of the warriors were useless. No Spanish soldiers were killed. Many Excanxaques lives were lost, but no actual number was ever recorded. The battle lasted off and on for the better part of one afternoon, with the Spaniards slowly working their way down and out of Etzanoa and across the (Arkansas) river. Eventually the Excanxaques withdrew from the fight with the Spaniards. The hostage Rayado chief, Caratax, was freed unharmed by a raid on Oñate and Oñate freed several women captives, but he retained several boys at the request of the Spanish priests, so they could instruct them in the Catholic faith. The Oñate expedition made its way directly back the colony in New Mexico arriving on November 24, 1601, without finding any of the riches they had been hoping for. This is called the Battle of Etzanoa.